Once again, I started writing about one topic and ended up focusing on another. I didn’t want to get rid of the first one though, so this is a combo post. Just a heads up! This week is smooth week! Teacher and I have been alternating between rhythm and smooth on our lessons. At first, we switched every lesson, but I quickly realized I needed at least a second lesson in the same style to follow up on what we worked on in the first lesson. So now, since I have two lessons a week typically, we alternate every week. 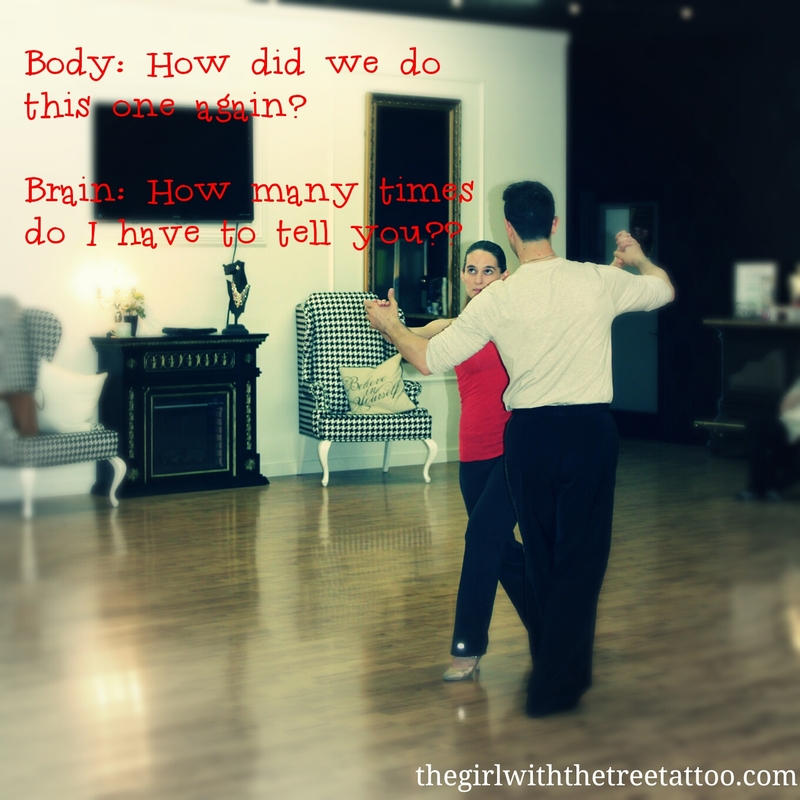 At yesterday’s lesson, Teacher wanted to go through our waltz routine, review the names of the different steps, and then watch me dance on my own to see how well I knew the steps. Then we were going to do the same with tango. We never got to tango. There is a technique called visualization, where basically you see the outcome you want in your head. Athletes will use it to visualize the outcome of an event, like winning a big game or, if they’re in Rio, winning the gold medal. I use it to review routines or specific dance technique. Given my time and money constraints, visualization is a great tool for me to get some practice in, even when I can’t actually put on my dance shoes and move across a floor. Yesterday I spent a lot of time visualizing how my frame should feel. We had made some progress with me keeping my lats down last week, which helped me stay grounded in rhythm. I wanted to make sure I applied the same thing to my smooth to keep myself balanced. I really wanted to impress Teacher in the first lesson of the week, so we could move on to working on things we haven’t touched in awhile, like foxtrot or Viennese. It was a nice idea. I got a little distracted by my demons between my visualization and actually arriving at the studio for my lesson (warning: topic change). I’ve read and heard a few comments about pro-am ballroom in the last week or so that boil down to the assertion that being a pro-am ballroom student doesn’t really mean anything to the rest of the ballroom world, except as a way for “real” ballroom dancers and comp organizers to make money. It was a direct stab to my heart because dancing and competing with Teacher (and now practicing with Ballroom Viking) is my only current option for advancement in ballroom. I don’t have another dance partner with whom I can compete, though I am looking. And I’m not just doing this for fun or because I have money to burn. Dancing means a great deal to me and I want to grow and learn as much as I can, all the way up to the professional level if possible. I know I’m not Teacher’s partner in the same way that his pro partner is his partner, but the partnership should still count for something more than a paycheck. Maybe a pro-am heat at a competition doesn’t bring the wow factor that an amateur or professional heat does, but just because half of the dancers paid the other half to be on that floor doesn’t make them less significant as dancers. With Embassy Ball (the world championships) and USDC (the national championships) coming up, I would think the students who win the pro-am championship titles will want to be recognized as champions at their levels, and not dismissed because their titles don’t really mean anything (because it’s just pro-am). Am I being too idealistic? Do I need to accept the reality that I am “just a student” and at the end of the day, the performances Teacher and I dance together do not really matter to anyone except me? Part of my problem is I still want to be recognized as a “real” dancer by the people “who matter,” whoever they are. I have an ego that likes some attention, I’ll admit it. I don’t want to be viewed as just a student, even a great student. I want to be viewed as a great dancer, whether or not my partner happens to be my teacher, who I have to pay to dance with me. I have bigger ambitions than taking weekly dance lessons and attending a local comp once a year. I’ll end my little rant there because the answer is obvious: it doesn’t matter what other people think, whether they are people “who matter” or not. What matters is what I think and feel. I take my dancing seriously and therefore I take my pro-am competitions seriously. So I will feel accomplished if I place well and I will definitely consider myself a champion if I ever win such a title, even if it is just a pro-am title. Maybe some day I’ll find a competitive partner who I don’t need to pay, and we’ll work our way up the ranks and gain that recognition. Until then, I need to continue to remind myself that I’m on a personal journey in a partner sport. So I have to look within myself for the recognition. I gave myself a break though because I remembered my body is a much slower learner than my brain (back to my original topic). I’ve always been a good student, in and out of dance, and if something makes logical sense, it’s very easy for me to understand. Teacher is very good at explaining the logic behind dance technique and so my brain can grasp it almost immediately. My body on the other hand requires repetition after repetition, and then if you introduce something new, it forgets the first thing it learned and you have to repeat again. Perfect example: Ballroom Viking met me at the studio after my lesson to get some practice time in. We started out with his waltz routine. We had spent our entire first practice session on it, but I didn’t have it memorized. So I just let my body remember what it could and I followed the rest. There is one move that requires me to do a little spiral turn to get into shadow position. As soon as my body didn’t do the turn correctly, my brain chimed in, “that was supposed to be a spiral.” My brain knew it, but it took my body at least three times to do it right. The funny thing is when my body does do something correctly, my brain doesn’t always believe it. So Teacher may tell me something looks improved, but I can’t tell the difference yet. I guess I just need to keep exercising that brain-body communication line! They are on the same team after all, a little cooperation would be nice! I have one more lesson and practice session this week. Hopefully, all communication lines will be open! P.S. 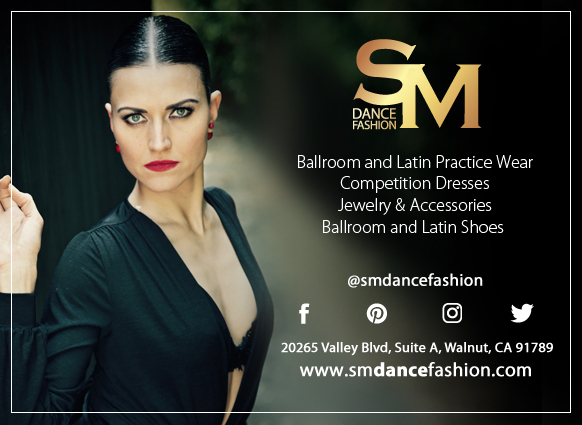 – Teacher and his pro partner are competing at another Star Dance Tour event this weekend! They are dancing at the NV Ball in Las Vegas on Saturday, August 20. A FREE live streaming of the event will be on the Tour’s website: http://sdt.dancebeat.com/index.php/m-streaming. Watch them in the Open Smooth event around 9:30pm PST, the show dances will be right after, and THEN it will be time to VOTE! I will post more detailed instructions tomorrow. Thanks guys! Star Dance Tour – NV Ball: Vote for Kris & Briana!